Our recently renovated Beachfront Condo is located on a private beach in Dennisport overlooking the Nantucket Sound. The unit has 2 bedrooms, one being a loft, new kitchen with granite and stainless steel appliances, 1 bathroom and living room. It's great for a party of four if you like to be steps from the beach! THE SPACE - We have created the perfect setting for Cape Cod summer days. Our condo has a beautiful and spacious loft with a big screen t.v. The downstairs is a living area, kitchen, bathroom and one bedroom. The interior boasts a beach feel and encourages a kick back and relax mentality. If you want to get away from it all and look out onto Nantucket Sound all you need to do is walk out the back door and enjoy! Hello. My name is Claudia and I am the Vice President of The JCH Gruppo, LLC. We are a property management company that owns condos, multi families and single families in Massachusetts. Our goal is to provide people with great places to rent. I have been an owner of this property for 20 years and it is a hidden gem on a private beach. We pride ourselves on providing a clean living space and comfortable living space for you to enjoy. Our clients love their experience and we hope that you will too! Our beachfront condo offers everything you would want from a getaway on the beach. A waterfront view from the back door and steps onto a private beach where you can kick back and take in the sights of sail boats passing by. A dip into the ocean followed by a cocktail and barbecue. Inside we have completely renovated the interior space. The JCH Gruppo prides itself on offering state of the art equipment, finishes and furnishings. The bedding is comfortable and well appointed. Private beach at a great price!! Bathroom is newly renovated with tile and standup shower stall. Condo is located 75 yds. from private beach. Our family of 4 loved our stay at this lovely, modern & spacious beach condo. We really enjoyed the beach at the end of the row & also the outside space at the back. All the neighbours were really friendly & gave us great advice on where to visit. The condo is ideally situated mid-cape & everywhere is easily accessible. However - I’m sorry Claudia - but for an honest review I have to agree with some previous comments and consider it unreasonable to instruct guests to launder bedding & towels prior to 10am checkout - particularly after having already paid a $100 cleaning fee! Also, it was extremely hot during our stay and I found the lack of AC quite uncomfortable; although the living room ceiling fan, the upstairs bedroom floor fan & the downstairs bedroom window fan, did provide some relief. Ceiling fans in all rooms would be a huge improvement! All-in-all though we did have a great stay here & I would recommend this rental. We provide a wonderful condo to stay in at a great price!! In order to keep prices low, guests are required to launder the towels and sheets. This is not an usual request as many rentals on the Cape and Islands have the same procedures. The laundry room is located two doors down from our unit, we provide laundry detergent and we have a change machine and these tools make it super easy to launder the sheets and towels. You might want to consider a hotel in the future if this type of set up does not work for you but be prepared to pay higher prices. The cleaning fee is to clean the condo and nothing further. Again, this price would go higher if laundry had to be included. The beauty of our beachfront condo is that it is located on the beach and therefore the ocean breeze typically keeps the condo cool. This summer was unusually warm. We have a ceiling fan in the living room, and fans in both bedrooms. We have hundreds of repeat clients that love our space and the experience we provide. We had a great time in Dennisport! The condo was,as advertised, recently renovated and clean. Really nicely decorated and comfortable. The loft was a really nice space for the kids. Our favorite part was the beach near the condo. It was almost empty every time we went and was just gorgeous and peaceful. The whole row of condos was in fact, very peaceful when we were there. If you are sensitive to heat and humidity, we did find it hard to cool the condo down. We used all the fans but the loft was still too hot and my kids had trouble sleeping. We ended up setting them up on the floor downstairs to sleep. Also, please note that you must wash the linens and towels you use before checkout! It's good to know this ahead of time, because it requires some planning. Overall, though, this is a great, modern, comfortable beach condo in a beautiful place. We had a great stay! Location couldn’t have been any better, and with a little one, walking distance to the private beach was a plus! Side walks in the area make getting around very easy on foot with many places to eat under 2 miles away. Also, an added bonus of being in the middle of the cape which makes access to national seashore beaches less than 45 min away, even with some traffic. The condo was very well appointed and comfortable beds. We brought our own sheets and towels because we know getting out the door for checkout at 10am would be hard enough, let alone doing laundry before. We had insanely hot weather, and having no AC was a bit daunting, but luckily the window fan and upstairs fan made the nights bearable. I would definitely recommend considering to stay here. We enjoyed our stay in Dennisport and the Beach Condo was a great fit for our needs. The condo was very clean and Claudia very attentive to any questions we had. The only thing we missed was a microwave to reheat some take-out one day. Thank you so very much for taking great care of our beloved condo. We are so glad you enjoyed your stay. Sorry about the micro wave but we do not offer this item for health reasons. We stayed for only four nights, which was way too short! This is a great place to relax. 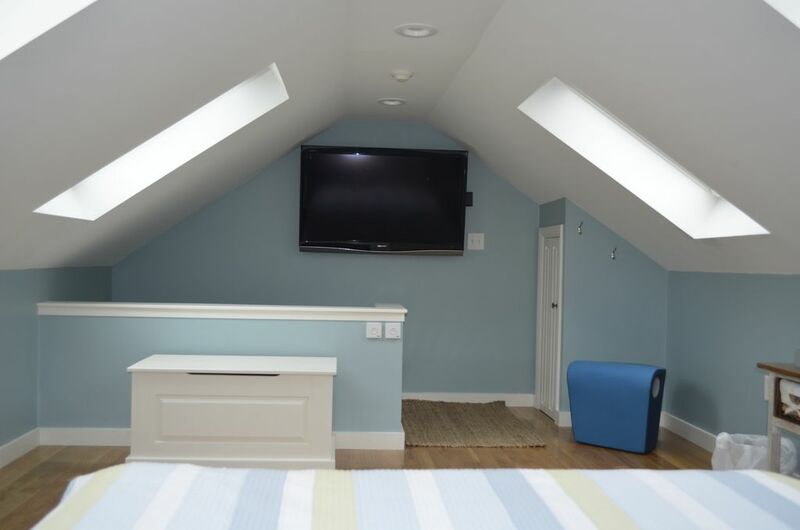 Only a few steps away from a private beach, the place was great, the kids enjoyed having their own space in the attic and the manager was extremely helpful. Some of the units are occupied by owners, who are really friendly. Condo is beautifully updated within walking distance of private beach. Property is as advertised. Beautifully updated. Comfortable with all necessities. Quiet neighborhood. Nice neighbors. Private beach in short walking distance. Can see ocean from couch, very nice. We loved it and hope to return. Thank you so much for your kind words and we are thrilled that you love our beachfront condo as much as we do! We also want to thank you for leaving our condo in great shape. Please come back again! The Beachfront Condo is quietly nestled at the elbow of Old Wharf Road. Close by you will find bike and kayak rentals, and West Dennis beach is less than a two mile walk way. The bike path is close by and can take you as far out as the National seashore. Dennis Center, Sundae School Ice Cream shop and unique specialty stores are a short drive away, and let's not forget the infamous and everyone's favorite, The Christmas Tree Shop. Do all or do nothing - it's all here for you. Currently we only rent Monday-Friday, therefore, we do not have a weekly rate.